Kakley, M. R., Velle, K. B. and Fritz-Laylin, L. K. (2018). 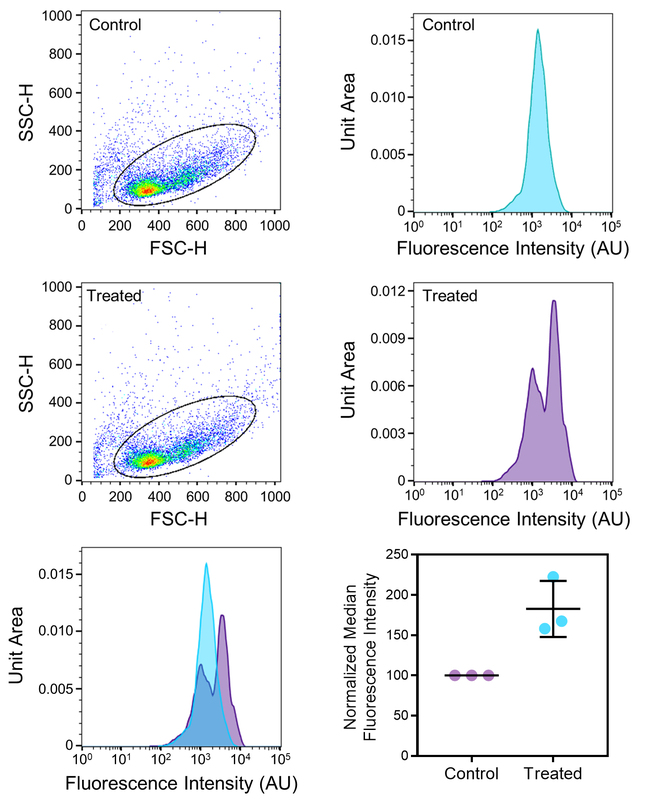 Relative Quantitation of Polymerized Actin in Suspension Cells by Flow Cytometry. Bio-protocol 8(22): e3094. DOI: 10.21769/BioProtoc.3094. Fritz-Laylin, L. K., Lord, S. J. and Mullins, R. D. (2017). WASP and SCAR are evolutionarily conserved in actin-filled pseudopod-based motility. J Cell Biol 216(6): 1673-1688. The amount of polymerized actin within a cell can vary widely due to natural processes and/or experimentally induced perturbations. We routinely use this protocol to measure relative polymerized actin content between cell populations by staining cells in suspension with fluorescent phalloidin, then measuring total cell fluorescence using flow cytometry. Although developed for human cells, we have easily adapted this method for use with diverse eukaryotic cell types. Biologists have long studied actin polymers using biochemical assays and fluorescence microscopy. The latter has been facilitated by the discovery of phalloidin, a small molecule toxin produced by poisonous mushrooms that stabilizes actin structures by specifically binding adjacent monomers within actin polymers (Vandekerckhove et al., 1985). Fluorescent phalloidin conjugates stain complex actin structures and facilitate detailed visualization by fluorescence microscopy. However, quantitating this fluorescence can be painstaking, particularly when tracing population-level changes. In contrast, flow cytometry quantitates the total fluorescence intensity of thousands of cells per minute. Here we describe how we estimate differences in the amount of actin polymer between cell populations by staining cells with fluorescent phalloidin, measuring the total cell fluorescence of individual cells using flow cytometry, and finally comparing the fluorescence values of the populations. It is important to note that this approach is comparative and cannot be used to measure the absolute concentrations of cellular actin polymer. This approach requires cells to be in suspension; if your cells require adhesion for proper actin polymerization, we suggest using quantitative fluorescence microscopy as described above. Although rapid and quantitative, flow cytometry provides no information about cell morphology. Therefore, we routinely save an aliquot of stained cells for visualization using fluorescence microscopy. We highly recommend doing this to ensure proper preservation of your structures of interest (Figure 1). Fluorescence microscopy can also reveal variation in experimental samples that are not apparent by flow cytometry. This protocol is optimized for differentiated HL-60 cells that can be stimulated with fMLP to induce rapid actin polymerization (Figure 1, for additional information about these cells, see Fritz-Laylin et al., 2017), it can be modified for use with a wide variety of cell types by testing a variety of fixation conditions and buffers. For example, we have adapted this protocol for chytrid fungi (Batrachochytrium dendrobatidis), and the amoeba Naegleria gruberi (unpublished). To do this, we chose conditions that: 1) best preserve the overall morphology reasonably similar to live cells as visualized using DIC or phase contrast microscopy; 2) keep the polymerized actin intact through fixation; 3) when imaged by fluorescence microscopy, stain the appropriate structures. For information on buffers and fixatives (see Note 1) commonly used to preserve actin structures, we recommend the methods resource Fluorescence Procedures for the Actin and Tubulin Cytoskeleton in Fixed Cells from the Mitchison lab at Harvard University (L. Cramer and A. Desai). Figure 1. An example of actin polymerization in response to cell stimulation. Maximum projection of AlexaFluor® 488 phalloidin stained HL-60 cells before and after treatment with 20 nM fMLP, which induces actin polymerization and results in brighter cells. Note: Check your cytometer requirements and/or your flow cytometry facility's recommendation for tubes. Prepare fresh fixation buffer and keep on ice until needed. Label 1.5 ml tubes for each sample, including untreated and treated cells that will be stained with phalloidin, as well as matched control samples that will be processed identically but will not be stained with phalloidin (unstained controls). Prepare cells by concentrating to desired density by centrifugation and suspension in 100 μl per sample of fresh media or buffer; the minimum number of cells typically required for FACS analysis is 10,000 per sample (see Note 6). For stimulation of HL-60 cells, resuspend in serum-free RPMI supplemented with 2% BSA, and incubate for 1 h at 37 °C and 5% CO2 to depolarize the cells. Stimulate cells by adding 10 ul of 200 nM fMLP, gently tapping tube to mix, and incubating at 37 °C for 3 min (treated sample), followed by immediate fixation (do not do this for the control, untreated samples). Immediately fix cells in 1.5 ml centrifuge tubes by adding 400 µl of cold fixation buffer to each sample. Mix the sample by gently pipetting up and down. Incubate on ice for 20 min (see Note 5). Centrifuge cells at 4 °C to form a pellet (see Note 6). Remove the supernatant and resuspend cells in 100 µl of permeabilization buffer (see Note 2), and mix gently by pipetting up and down. Centrifuge to pellet cells at either room temperature or 4 °C. Remove supernatant and resuspend cells in 100 µl of staining solution (see Recipes and Note D). Gently resuspend cells by pipetting up and down. Cover samples with aluminum foil and incubate at room temperature for 20 min then transfer to 4 °C. The length of time that samples can be stored in phalloidin can vary depending on the cell type; test this empirically when working with a new cell type (see Note 5). When ready to analyze cells by flow cytometry, centrifuge to form a pellet and remove the phalloidin supernatant. Wash several times by gently resuspending cells with 500 µl of PBS supplemented with 0.1% TWEEN-20 (a mild detergent used to break up the cells and avoid clumping) and centrifuge at 4 °C to form a pellet. After the last wash, resuspend in at least 500 µl of pre-chilled PBS and store samples on ice. Filter samples before flow cytometry (see Note 7). Check stained samples via fluorescence microscopy to ensure target structures are stained and that the overall cell morphology has not been compromised (the cells should look approximately similar to how they looked when alive). To ensure there are enough cells for the experiment, take an aliquot of stained cells and enumerate using a hemocytometer. This is not intended to be a complete guide to flow cytometry, and we suggest that readers unfamiliar with this technology see: the Flow Cytometry Basics Guide from Bio-Rad, FlowJo video tutorials such as Cytometry 101 (https://www.flowjo.com/learn/flowjo-university/flowjo/getting-started-with-flowjo/2) or BD Biosciences Introduction to Flow Cytometry Web-Based Training (https://www.bdbiosciences.com/us/support/s/itf_launch). 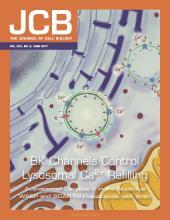 For the HL-60 cell data presented here, we used a FACSCalibur analyzer (BD). For this analysis, we measure FSC-height, SSC-height, and FIT-C: height, log. We also recommend collecting either FSC-width, SSC-width, and/or FSC-area if the cytometer has those capabilities, as these values will allow for elimination of doublets (see Note 9). The differences in sample fluorescence are large, so we display the fluorescence intensities in log scale. FACSDiva software displays a worksheet populating data into histograms, scatter plots, and provides population statistics based on gating. We recommend setting up a global worksheet to visualize data during the adjustments and acquisition. Depending on your cytometer, adjust the laser intensity and/or the detector to 1) capture forward and side scatter (to eliminate dead cells, clumps, doublets, etc. see Note 9 for doublet elimination) and 2) make sure that your samples are fluorescing within the detectable range. Adjust these parameters as your control sample is running through the flow cytometer at a low speed. Typically, a scatterplot with forward scatter and side scatter will show the population in real time as cytometer collects data. The target population should be well separated from the axes to avoid exclusion of data. Using a selection tool, create an initial gate by setting points around the entire population and adjust the cytometer to center the fluorescence intensity of the entire cells in the population. Do this very carefully because you cannot later recover data outside of the range of the detector. Once the lasers and detector are properly adjusted, use the same laser intensities on all data collected for all samples in the replicate. The cytometer can (and should) be adjusted for each experimental replicate, but once set for your experiment, analyze all samples using the same cytometer settings (see Note 8). If you have an unstained sample, a low-level background fluorescence is normal as dead cells autofluoresce. We use FlowJo software (Tree Star) for analysis of flow cytometry data. Here, we briefly describe our analysis workflow. For more detailed discussion of analysis of cytometry data, see the data analysis tutorials for BD FACSDiva (https://www.bdbiosciences.com/us/support/s/itf_launch) or FlowJo (https://www.flowjo.com/learn/flowjo-university/flowjo). Importing files into FlowJo should automatically populate groups according to file names. If you need to create groups for analysis, there is a tool to select groups based on keywords in the file name ($fil) and other parameters. Apply gates uniformly to all samples in the entire replicate. The gates described here 1) select intact cells and exclude cell debris; 2) establish populations; 3) allow for comparative analyses between samples (see Note 8). Open the graphing window and create a scatterplot with SSC-height (SSC-H) on the y-axis and FSC-height (FSC-H) on the x-axis. We like to use the pseudocolor option for the scatterplot since the monochrome dot plot reduces the number of events to represent only some of the data. Also, pseudocolor is easy to visualize the concentrations of events to establish gating. If the cytometer has the capacity to collect width and/or area data, gate the cell population to eliminate doublets (see Note 9). Select a cell population, being careful to not exclude data from the main cell population, using the ellipse tool (Figure 2). Open this gated population as a histogram. Display the x-axis as “FIT-C” and the y-axis as a histogram. Add statistics such as median. Copy the analysis to the entire group. This creates a group gating hierarchy to allow for analysis of relative actin intensities within that group. Figure 2. Flow cytometry and analysis of actin polymerization. As an example of the experiment outlined in this protocol, we analyzed untreated and stimulated HL-60 cells as shown in Figure 1. To exclude cell debris and/or clumps, first set a forward and side scatter gate around the concentrated cell population (shown in pseudocolor) and apply it to all samples uniformly. Note: When differentiated with DMSO, not all of the cells fully differentiate, resulting in two populations of cells seen here. The histograms show the relative intensity of cells within the gates. The fluorescence intensity of the untreated cells (top right) has a single peak while the treated cells (middle right) have 2 peaks. A shift in actin intensity is easily seen in the overlay of histograms (bottom left). The median intensities of the untreated samples are set to 100%, and treated samples median intensities are normalized to the untreated controls. Histograms will automatically populate in FlowJo with “count” (the total number of cells under that gate) on the y-axis and arbitrary units of intensity in log scale on the x-axis. We normalize data on the y-axis to unit area and not to the number of cells (Figure 2) since the number of cells within a gate can vary by sample. FlowJo defines unit area as the maximum area equalling 1 unit with fluorescence intensity as a percentage of that area. FlowJo histograms place each cell (“event”) in one of 265 bins based on its intensity. After analyzing all samples, compare relative actin intensities by layering the histograms in the graphing layout window of FlowJo (Figure 2). We use FlowJo to calculate the median fluorescence intensity of each cell sample. We normalize data to compensate for variation in fluorescence intensity between replicates due to drift in the lasers and detector (see Note 8). The untreated samples are set equal to 100%, and the treated samples are relative to the untreated samples (Table 1). We use Prism to draw scatterplots showing means and standard deviations (Figure 2). Fixative: There are a number of fixatives commonly used to preserve the cytoskeleton, including methanol, glutaraldehyde, and paraformaldehyde. For this analysis, we use paraformaldehyde because methanol destroys the phalloidin binding site and, although glutaraldehyde is the fixative of choice for maintaining cell morphology it results in high autofluorescence that is difficult to quench when cells are in suspension. Permeabilization Buffer: Triton X-100 is a mild detergent that is commonly used to permeabilize cell membranes. We make a fresh dilution on the day of the experiment. Triton is viscous and can be difficult to pipet. We recommend using wide bore tips or cutting off the end of a regular pipette tip using a clean razor blade. Fluorescently labeled phalloidin: There are many fluorescently conjugated phalloidins that are commercially available. Choose one with a fluorophore that is compatible with both your flow cytometer and microscope filters. We typically use AlexaFluor® 488 conjugated phalloidin (Invitrogen), as it is bright and relatively photo-stable. Although the manufacturer recommends dissolving the phalloidin in methanol, we routinely resuspend the lyophilized phalloidin in DMSO, to a final concentration of 66 mM. Staining solution: Prepare the staining solution fresh and keep it cold until use, then allow it to come to room temperature before staining. The fluorescent dye is photosensitive so keep this out of direct light and/or cover in foil until use. You may need to optimize and empirically test concentrations of phalloidin that work best for your cell type. Storing samples: Although fixed, the actin cytoskeleton of cells is labile for two reasons: 1) the actin cytoskeleton is inherently dynamic. Because phalloidin binds multiple adjacent actin monomers, it serves to stabilize actin polymers, and drastically increase their lifetimes, even in fixed cells. It is best to stain your fixed samples as soon as possible. 2) Paraformaldehyde is a reversible fixative, and samples will not persist indefinitely. It is best to fix, stain, and analyze your samples on the same day. If you want to store samples for any length of time, we recommend testing this approach by imaging the phalloidin stained samples before and after storage. Carefully removing supernatant from tubes: It is crucial to leave a small volume around the pelleted cells to avoid disturbing the pellet and losing your sample. Do this by holding the tube at an angle with the pellet towards the ground and pipetting the supernatant off slowly and from the opposite side of the tube. If successful, the pellet should look unchanged after each step (before permeabilization). You should empirically test at which speeds and how long it takes for your cells to form a pellet without compromising cell morphology. Testing centrifugation speeds: Permeabilization creates holes in the cells’ membranes changing the density of the cell relative to the buffer. For most eukaryotic cells, centrifuging for 5 min at 1,000-2,000 x g is a fairly safe starting point. We recommend increasing centrifugation to get the best pellet without compromising overall cell morphology. Again, this should be empirically tested. Check samples on a microscope after each spin (e.g., 2 µl on a slide). If there is an increase in cell debris, you may be centrifuging too fast. Allowing sufficient cells for adjusting FSC/SSC laser intensities: Adjusting parameters can take time and requires samples to run during these adjustments. To avoid running out, prepare at least 3 times the volume needed for your controls careful not to dilute control samples as they should all roughly have the same cell densities. We recommend in the first trial experiment that you check the initial density of cells before fixing and record the cell density as well as the final density; you can use these densities to calculate the percent loss. Modify your starting cell densities according to the percent loss to guarantee you have enough cells to analyze. If cell loss is an issue, consider recording cell density after each centrifugation step to determine where you are losing cells. Cell clumping: After permeabilization, cells are generally stickier, and easily form clumps that are difficult to break apart. This is problematic for cytometry for several reasons: 1) Clumps clog flow cytometers, and therefore you must filter your samples before acquisition, greatly decreasing the number of cells in your sample. 2) Small cell clumps can be measured together as one larger cell with the combined intensity and a false population. To break up cell clumps gently mix by pipetting the full volume up and down and/or gently vortex before transferring samples to FACS tubes. We recommend checking a sample for clumps on a microscope (e.g., 2 µl on a slide). Comparing samples prepared/analyzed on different days: It is critical to process and analyze all samples of each biological replicate in parallel due to variation in phalloidin staining and fluorescence detection by cytometry. Measurements from samples within a replicate stained or analyzed on different days cannot be meaningfully compared. FSC-H vs. FSC-A: Display the data on a scatterplot with FSC-height (FSC-H) on the y-axis and FSC-area (FSC-A) on the x-axis. Select the polygon tool to establish the first gate around the population along the diagonal line. This gate selects “singlets” or single cells of similar size compared to total cell area and removes cell clumps or “doublets” from the data set. FSC-W vs. FSC-H: Display the data with FSC-W on the y-axis and FSC-H on the x-axis. Gate the population to exclude data points with FSC-W at higher values than the main population. SSC-W vs. SSC-H: Display the data with SSC-W on the y-axis and SSC-H on the x-axis. Gate the population to exclude data points with SSC-W at higher values than the main population. Note: All recipes below are made at room temperature and aseptically with Milli-Q water. Note: PFA degrades over time, so a fresh ampule is best. We routinely use 16% Paraformaldehyde sold in 10 ml vials (Electron Microscopy Sciences). Once opened, we typically will use an open ampule for up to two weeks stored at 4 °C. This protocol was adapted from previously published work (Fritz-Laylin et al., 2017). We would like to thank Amy Burnside at the University of Massachusetts Amherst Flow Cytometer (FACS) Core Facility for assistance with data analysis. We are funded by the National Institutes of Health (NIH NIAID) Grant 1R21AI139363. We have no conflict of interest or competing interest to declare. Vandekerckhove, J., Deboben, A., Nassal, M. and Wieland, T. (1985). The phalloidin binding site of F-actin. EMBO J 4(11): 2815-2818.